The deck is ready-equipped when it is joined to the hull, the teak has already been laid and some deck fittings are already installed. Cable systems are integrated to connect up to the systems that have already been installed below the roof structures and in the hull. Fitting the deck is a delicate operation. 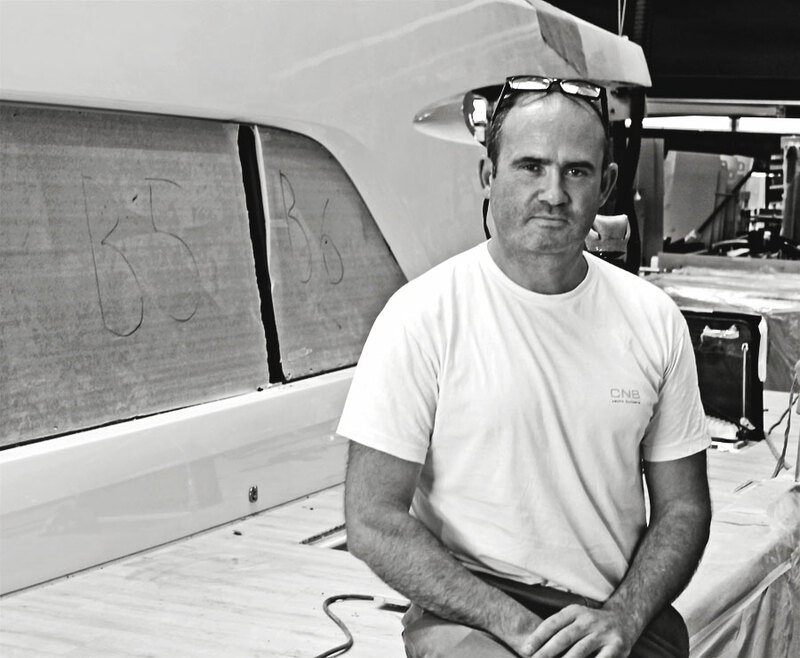 Lionel Lafon, Head of CNB's Carpentry team, took some of his precious time during these last few weeks of production work on the SEVENTY 7 to tell us about his team's work. What are the different stages involved in fitting the deck? 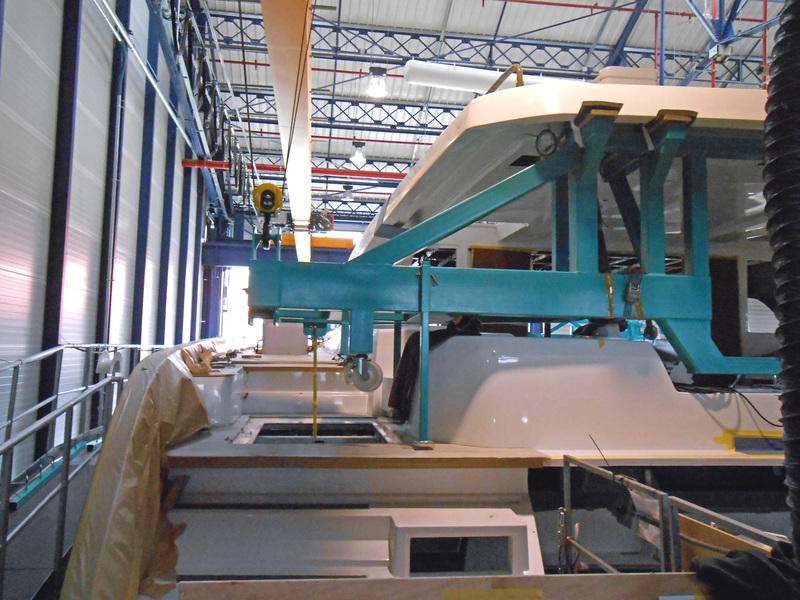 The deck is brought into the workshop on a load trolley, and placed alongside the hull, where it is fitted with all the handling equipment that will be used to lift the deck safely. 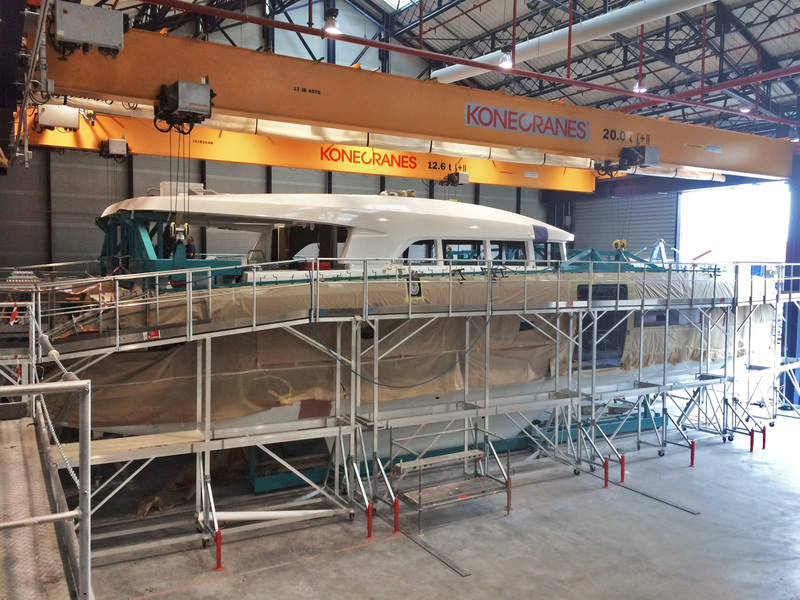 Next we'll attach the overhead crane to this equipment and lift the deck into position exactly above the hull. I’m in charge of the remote control and control the lifting operation while seven operators supervise the lowering of the deck, guiding me, each in their specialised trade: 4 carpenters, 1 electrician, 1 plumber, 1 deck equipment specialist. This involves making adjustments and performing all the operations required for final fitting of the deck and joining the deck to the hull. 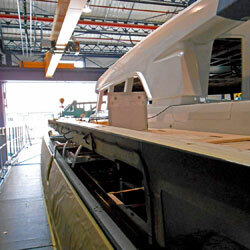 The deck is lowered very slowly to fit precisely to the hull. 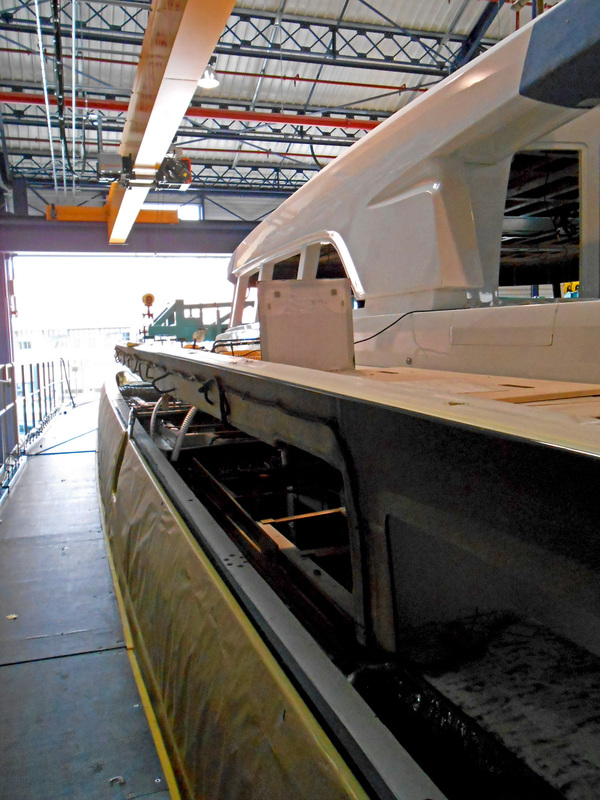 Once it is in position, we check the positioning of the technical equipment, and validate all the connections between the hull and the deck. There are always some adjustments that need to be made at the bulkhead so that the deck mates perfectly with the hull. Once these adjustments have all been made, we place pads of "Plastiline" (a sort of modelling clay) on the bulkheads to measure the air gaps between the hull and the deck so that we can work out the precise amount of sealant to apply. Then we mark where the bulkheads will join underneath the deck (to find the right position easily). Then, we raise the deck. 14 operators are needed for this delicate operation, which has to be timed precisely depending on the technical characteristics of the materials used, and consists in mating all the contact surfaces between the structural bulkheads of the hull and the deck. The Plastiline pads are measured and the thicknesses marked at the different points. Next, we meticulously sand down and degrease the surfaces on the underside of the deck (lowered back to ground level) and of the structural bulkheads of the hull, to ensure an immaculate join. 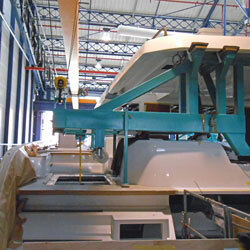 Guided by the markings, all the operators then simultaneously engineer the joints on the bulkheads. 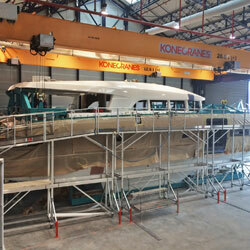 The deck is then immediately lowered into place onto the hull and fixed permanently. This assembly is always carried out at the end of the day to allow enough time for all the different components to dry overnight. Tools and equipment are removed from the deck, cleaned and put away, before moving on to the next step: adjusting the ceilings, linings and padding. Why is this such a delicate operation? Manoeuvring the deck, which weighs a few tons! Plus, because of the technical characteristics of the products, time is of the essence. Can you give us some figures about the deck? The operations, involving the different trades, take about a week. Head of the Carpentry team in charge of layout assembly. I joined CNB in May 1991 as an operator in carpentry production for one-off aluminium hulls, and I also worked on the first Lagoon 57 at CNB. There were 6 or 7 of us in the carpentry team at BX1, it was more of a craft workshop back then. Today we are 35 to 40 people working between BX1 and BX5, and that’s just in carpentry and layout. I also had a spell working in the Design Office as a layout designer (for Lagoon Switch), for a year. Then I joined the Methods department for around 5 years (one-off models – preparing furniture cutting lists). And then I came back to production at BX5 as head of layout, on the Bordeaux 60 No.30 I think.